Kongresshalle in Schwerin, Germany - The World Boxing Super Series (WBSS) tournament quarter-finals round concludes, as the old dog still has some bite - with former two-time world light heavyweight champion Juergen Braehmer (49-3, 35 KOs) outboxing previously undefeated Rob Brant (22-1, 15 KOs) for a twelve round unanimous decision. The scores were 119-109, 118-110 and 116-112. Braehmer was moving down from the light heavyweight limit of 175-pounds, while Brant was moving up from the middleweight limit of 160-pounds. 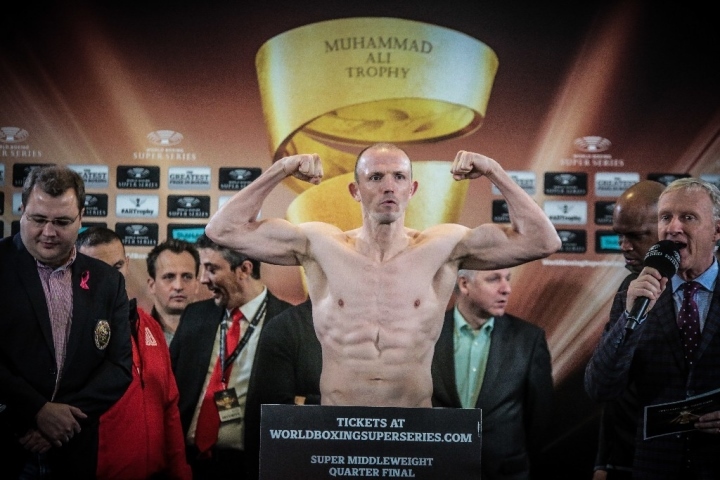 Braehmer will advance to the WBSS semifinals early next year for a world title shot against unbeaten WBC 'Diamond' champion Callum "Mundo" Smith (23-0, 17 KOs), who last month won a 12-round unanimous decision over previously undefeated Erik Skoglund (26-1, 12 KOs), of Sweden, in their WBSS quarterfinals match. Braehmer was making Brant miss, and making him pay, in the first round. In the second round, Brant was still having trouble getting his timing down, as Braehmer was countering well. Braehmer was landing the better counters in the third and the catchier punches. Braehmer was making Brant miss a lot of his punches. Every time Brant would land one, he was unable to follow up with a second shot. The timing of Braehmer and his punches from the southpaw stance continued to give Brant issues in the fourth. The fifth was the first round where Brant seemed to get off with some decent punches and busted up the nose of Braehmer. A hook to the body appeared to hurt Brant in the closing seconds. Braehmer came right back in the sixth, controlling the action and outworking Brant. Braehmer continued to control the action and the pace in the seventh and eight. Brant was unable to get things to change around in the ninth and tenth, but managed to edge the eleventh - which was very close and could have easily went the other way. In the final round, there was no sense of urgency from Brant. Braehmer, on the other hand, continued to box and kept his pace steady until the final bell. Super bantamweight Dina Thorslund (10-0) won an eight round unanimous decision over Nevenka Mikulic (7-10-1). Former WBA interim super middleweight champion Vincent Feigenbutz (27-2, 24 KOs) used a vicious body shot to stop Gaston Alejandro Vega (27-12-2, 11 KOs) in the eleventh round. Cruiserweight Micki Nielson (24-1, 15 KOs) put away Taras Oleksiyenko (8-4, 7 KOs) in the seventh round. Second straight win for Nielsen since losing to Kevin Larena last October. 2016 Olympic bronze medal winner Filip Hrgovic (2-0, 2 KOs), who turned pro less than a month ago, continued his run with a one round destruction of previously undefeated Pavel Sour (6-1, 5 KOs). Middleweights Abdul Khattab (15-2-1, 4 KOs) and Ronny Mittag (30-2-2, 15 KOs) fought to an eight round draw. In a rare instance, all three judges had it 76-76. People are actually shocked? When will people learn 160 is one of the weakest divisions in all of boxing? Don't know how many times I gotta say it, we've seen countless examples, this is just another one.